Chinese dissidents are being abducted outside China. 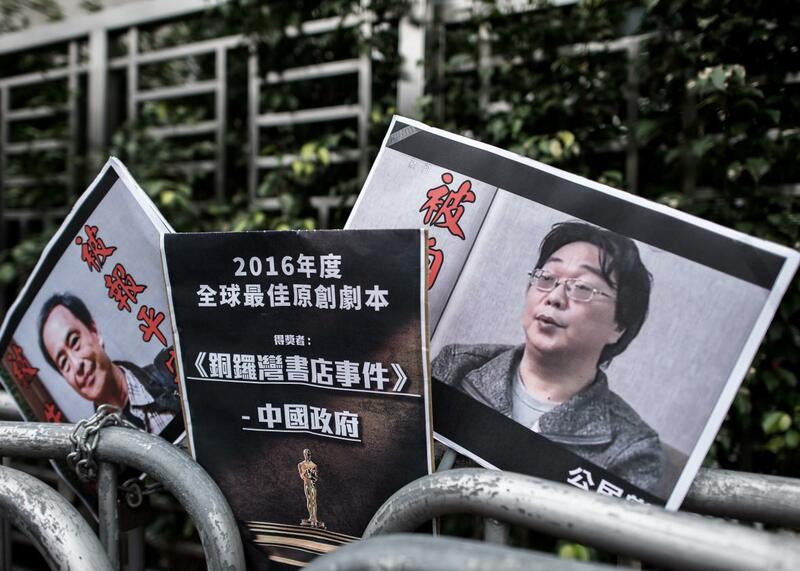 Placards showing missing bookseller Lee Bo and his associate Gui Minhai are seen left by members of the Civic party outside the China liaison office in Hong Kong on January 19, 2016. Journalist and activist Li Xin appears to be the latest critic of the Chinese government to have been abducted abroad and brought back to China, according to a new report. Li, a former journalist at the Southern Metropolis Daily, fled China last fall saying that the authorities had pressured him to spy on activists and non-governmental organizations. He first went to India and then to Thailand, home of a large Chinese exile population. But Li went missing on January 11 while traveling from Thailand to Laos. He contacted his wife this week from an undisclosed location in mainland China, saying that he voluntarily came back to China to help with an and that she should not talk to foreign media. “I know this is them speaking; it completely contradicts what Li Xin would like to say,” his wife told reporters, accusing the Chinese government of essentially kidnapping her husband. Li is the fourth Chinese dissident sent back from Thailand this month, raising fears that the country’s pro-Chinese military junta is assisting Beijing’s crackdown on dissent. On October 28, two dissidents were arrested on immigration violations in Bangkok—despite the fact that they were recognized as refugees by the United Nations and awaiting resettlement in Canada—and sent back to China where they later appeared in broadcast confessions on state television. That same month, Gui Minhai, a naturalized Swedish citizen who was a publisher and part owner of a Hong Kong bookstore known for selling anti-Beijing books, disappeared from his beachside apartment in the resort town of Pattaya. He later appeared on TV saying he had turned himself in over a hit-and-run incident 11 years ago. Lee Bo, co-owner of the store and British citizen, was quite clearly abducted from Hong Kong and sent his and colleagues some dubious messages claiming to have traveled to China to help with an investigation. Though part of China, semi-autonomous Hong Kong has its own legal system. “Cooperating with an investigation” is often used as a euphemism for police detention in China. Three other bookstore employees of the store went missing while visiting Shenzen in southern China. It’s believed that the store and the publisher house that co-owned it may have been targeted over a forthcoming gossipy book on President Xi Jinping’s love life. The recent abductions and extraditions send an alarming message to China’s critics abroad, that fleeing the country won’t necessarily guarantee protection. And the government’s refusal to allow the governments of Britain and Sweden access to their citizens may also be a violation of China’s treaty obligations. Another Swede, activist Peter Dahlin, was arrested on his way to the Beijing airport on Jan. 4 and released on the 26th, only after he gave a televised confession that he had broken the law by contacting human lawyers. He had been held for nearly two weeks before being given access to consular officials. We already knew that the Chinese government was cracking down on dissent more intensely than ever as President Xi Jinping has moved to consolidate his power and the country’s leaders have become increasingly jittery over the slowing economy. But if that crackdown is extending to foreign citizens or people living outside China, it should be a matter of international concern.